Guangzhou is busy with the preparation for the Guangzhou Asian Games that will take place in November. Some people in Guangzhou say the timing is not good, as the opening of the Games is only a few days after the completion of the Shanghai Expo. 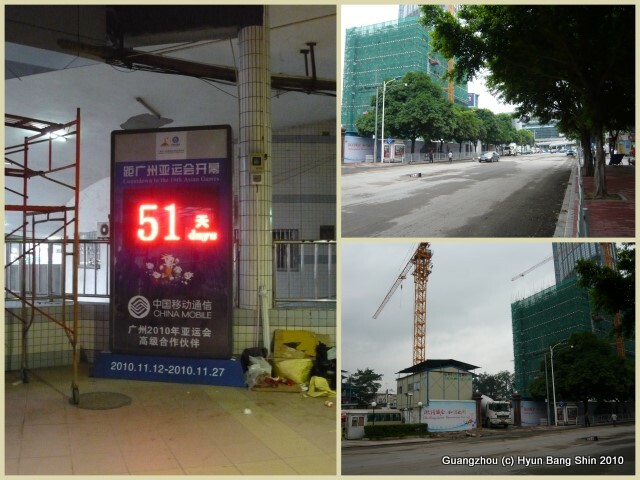 In any case, lots of construction works and beautification projects are taking place all over Guangzhou, and the government of Guangzhou wants to finish the originally planned refurbishment and beautification projects in time for the opening of the Games. The photos above show some of the scenes around the Guangzhou East Station where fast trains to Hong Kong depart from. Everywhere you go in Guangzhou nowadays, it is fairly easy to find these Games-related slogans and electronic count-down billboards. The whole station area was in a mess yesterday when I went there to take my train to Hong Kong. Three weeks earlier when I first arrived in Guangzhou, it was even messier. I suppose the remaining 51 days would see more intense mobilisation of resources by the government to complete the beautification and major construction projects considered crucial for the city to make it presentable to Games visitors. When a guest visits one’s house, everyone would usually try to clean his/her house to make it presentable and comfortable for the guest. When a city engages with beautification and refurbishment, it becomes a whole different story, affecting far too many residents who may find quite a few projects absolutely unnecessary. The decision to decide the extent of the clean-up, beautification and refurbishment often rests with high-ranking officials, reflecting their own notion of what a city should look like.